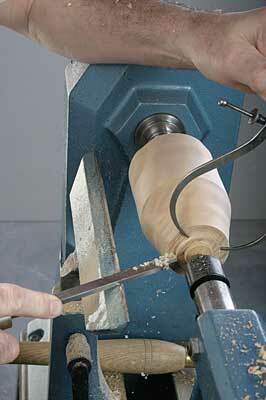 My first spindle turning project was the legs for a three-legged milking stool, which I made some years ago. When we had a milk cow, I used the stool every day for seven years. This was my second turning project made at the local high school, before I bought a lathe. I still have the stool and it brings back some fond memories of a time when we lived a self-sufficient lifestyle. 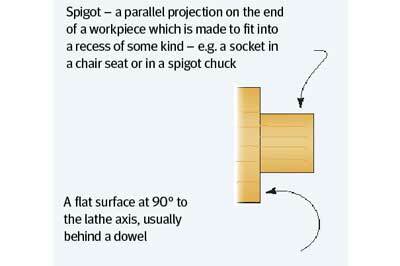 Chair legs, balustrades, candlesticks, rolling pins, porridge spurtles, lace bobbins and spinning tops, are all examples of 'spindle turning.' 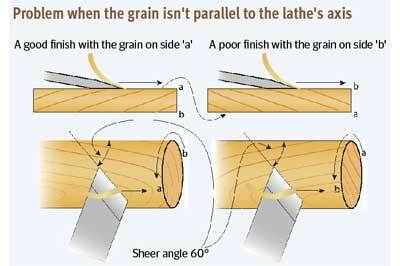 Anything that has the grain running along its length, and when mounted on the lathe, the grain is parallel to the lathe axis. All the turning is done on the outside. 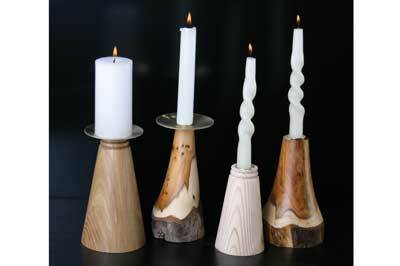 I would suggest a pair of candlesticks as your first spindle turning project, as they can be very quick and easy to make. With the addition of the candle holder and candle they make an impressive first project, and repetition is one of the best ways of developing and honing your turning skills. A soft wood such as redwood (Pinus sylvestris), has a square section that will turn easily and it is a timber that is readily available from timber merchants, though it is not very decorative. 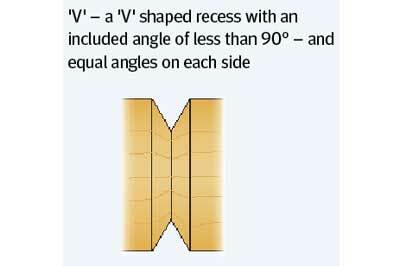 Square section will turn easily, and is readily available from timber merchants, but as before, is not very decorative. 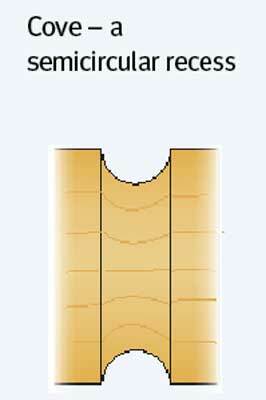 Almost any dry hardwood, square section, you have available will do the job. Yew (Taxus baccata) is very decorative with strong contrasting colours. If you have a branch of yew, perhaps leave part of the natural surface at the base. 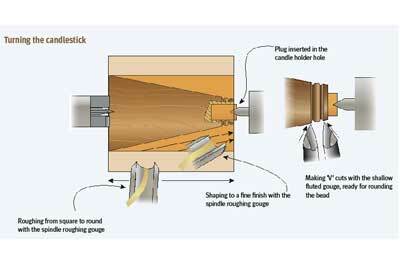 If I was doing this as a first spindle project â€“ with the advantage of hind sight - I would probably cut five pieces of wood, to make four candlesticks, from which I would select the nearest matching pairs. The fifth one would allow for a mistake to be made. 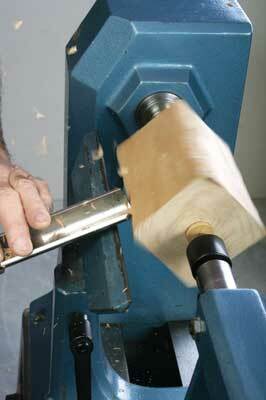 To cut with the grain along a straight 'cylinder,' the cutting edge of the tool should point along the cylinder. 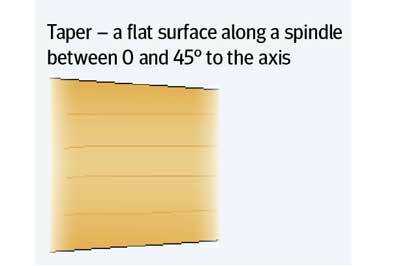 A good starting point would be a sheer angle of 45-60 degrees. 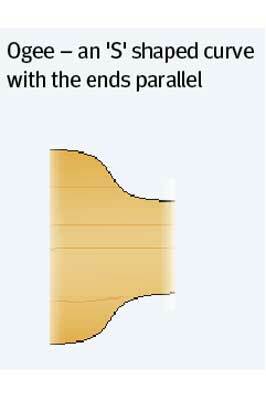 The example here shows the skew chisel, though the principle applies to all tools. 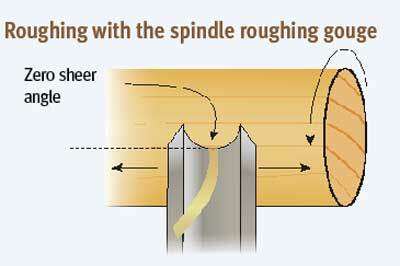 For roughing with the spindle roughing gouge, with the cutting edge parallel to the axis, the cut is across the grain and gives fast bulk removal, but will produce quite a poor finish. 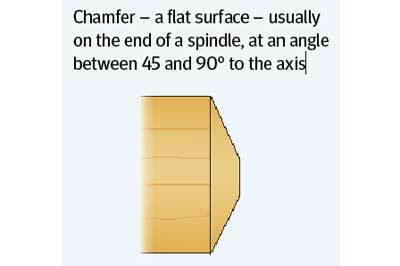 To cut at an angle to the axis, i.e. 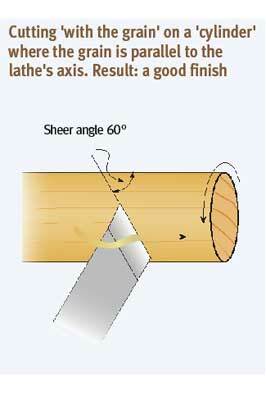 putting on a taper or chamfer, the cutting edge should point from the large to the small diameter along the spindle. 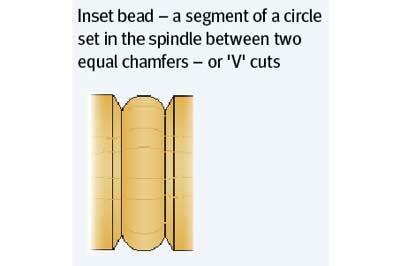 This applies to all the features on a spindle: beads, coves, 'V' cuts etc. 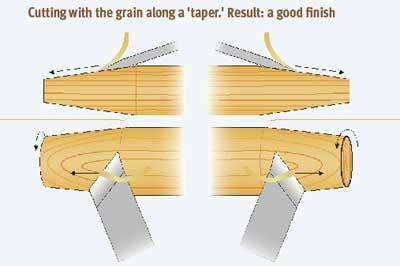 It is in the nature of wood that the grain isn't parallel all the time, add to that the planking process, and this means that the grain in a spindle may not be exactly parallel in the blank, and can sometimes be significantly off. 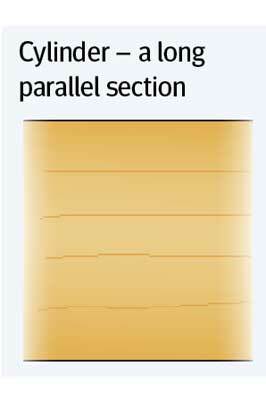 In such situations, a clean cut is obtained on one side of the cylinder, and a corresponding rough area on the other side. 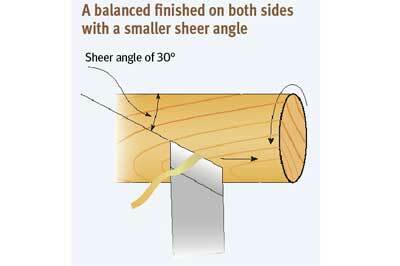 To minimise the problem, reduce the sheer angle to between 30-45 degrees and this will give a more even surface which can easily be sanded. 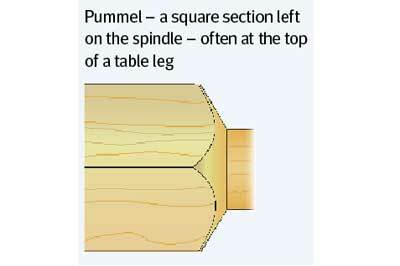 When a spindle has a section turned small, say less than 6mm diameter, then wood with parallel grain should be selected otherwise the wood will be very weak at the narrow point. The conventional method of holding a spindle is between centres using a drive centre at the headstock end and a support centre at the tailstock end. There is a range of different types of centres to choose from, though the two basic drive centres are four-prong and two-prong. Use the four-prong when the spindle end is square and flat, and use the two-prong centre when the spindle end is not square or when it is irregular in shape, and position it so that both prongs contact equally. 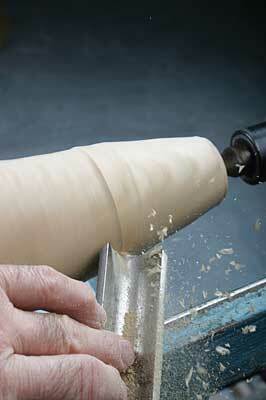 At the tailstock end, use a revolving centre with a cone for hardwoods or a cup centre for soft wood. 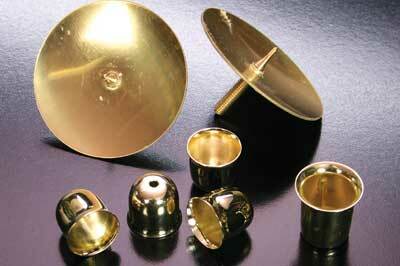 The design of a spindle is a series of features linked to form a flowing shape. 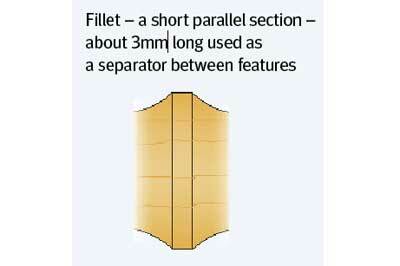 The main point about designing a spindle is 'definition,' each feature should stand out on its own, some features can run from one to another, but others benefit from being separated with a fillet. 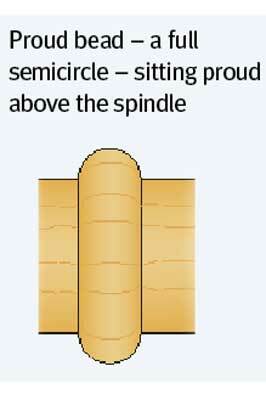 The proud bead is a good example of this. Where the wood is very figured or has contrasting colours, a simple design avoids conflict between the figure and features. 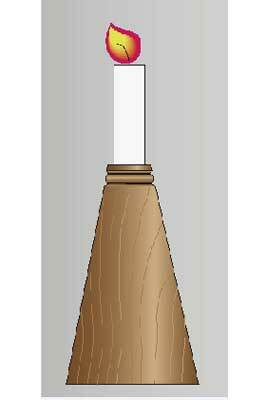 The design of a spindle is a series of features linked to form a flowing shape. 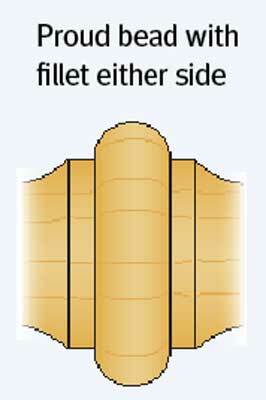 The main point about designing a spindle is 'definition,' each feature should stand out on its own, some features can run from one to another; others benefit from being separated with a fillet. The proud bead is a good example of this. The best way to approach design is to make rough sketches which can develop the design into a scale drawing. I must admit that most of my sketches are now completed using the computer. This is a useful approach for a number of reasons, the first is that it gives a drawing to work from; the second is that this can be made into a template for turning, which is particularly useful when you are making a pair or more. And thirdly, it gives you a record of exactly what you made so that you can repeat them at a later stage. 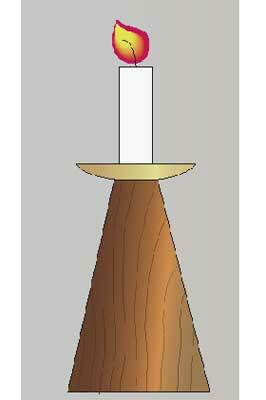 Dimensions will depend on the wood you use, as well as the type and size of candle holder. The diameter of the base is a crucial factor for the stability, as a candle holder needs to be stable for safety reasons, also weight at the base helps. The diameter at the top should be big enough to take an 'inset' metal candle holder, at least 6mm bigger than the holder. 10. Apply a suitable finish. 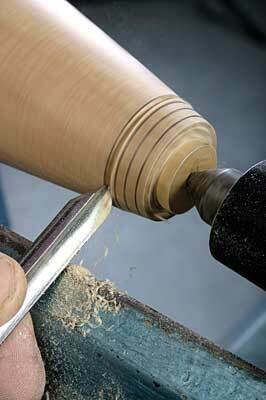 On a soft wood I suggest a 'hard finish,' but on hardwood, an oil will be good. Using a dish-type candle holder, the hole needed is small just to take the pin, but the top needs to be slightly hollow so that the disc sits neatly on the edge. Having made the first pair, it is a good idea to continue with candlesticks, develop a theme and style, and increase the size of the projects as you gain more confidence. Try using a different wood or a variation in shape - all these small changes will improve both your turning and design skills. 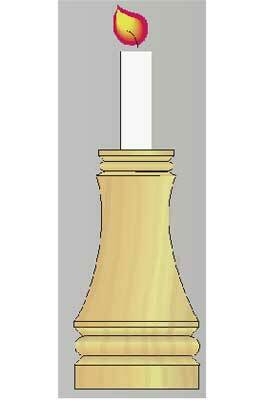 The front candlestick, made in redwood (Pinus sylvestris), is slightly smaller than the drawing. 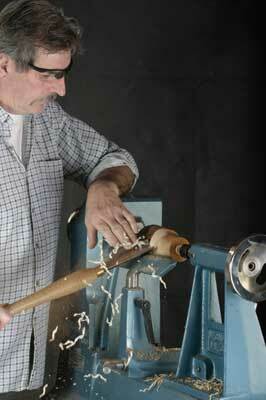 The one on the left is in oak (Quercus robur) which turned very nicely, and is the one photographed for the procedure. 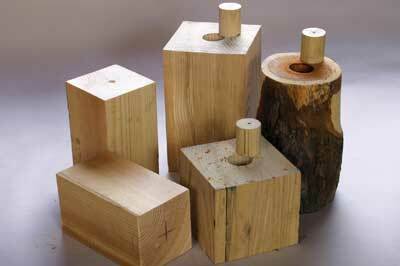 The other two are made from branches of yew (Taxus baccata). Here I left part of the natural branch at the bottom, then slightly curved the shape which enhanced the contrast between the heart and sapwood. These are all turned using the same process that is detailed in the article. The finishing touch is the 'right candle'. I must admit that the 'twisted' candle works well on the small candlesticks with the cup holders. Try turning these projects yourselves. Good luck!